Now we are going to take advantage of information provided by OpenNI and by the Kinect to make skeleton tracking. To start download OSCeleton here (if you don’t have a git client click on Downloads > Download.zip). Extract the zip file contents, browse into the folder and open OSCeleton.sln with Visual Studio C++ express 2010 (If you didn’t it, download it here). Once the project opened, generate the executable by pressing the F6 key or by clicking on Build Solution from the Build menu. After close Visual Studio, browse into the Debug folder which has just been created to check out if OSCeleton.exe has been generated. Finally verify that it was properly compiled by running the executable with the -h option to display all the available options: OSCeleton.exe –h. First download the examples provided at this address: https://github.com/Sensebloom/OSCeleton-examples (Downloads > Download.zip). Once the download is completed, expand the archive. 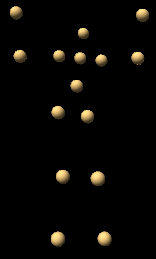 These examples use two free open source software which are Animata and Processing. 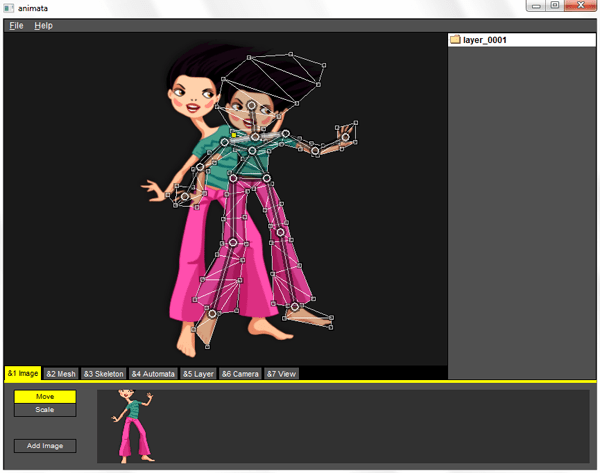 Animata is a software for real-time animation designed to create animations and interactive background that are similar to an environment of puppets. Processing is itself a development environment and programming language designed to easily create images, animations or interactions. If you don’t have it, download Animata here (version 004) and expand the zip file. Then run OSCeleton with these options: OSCeleton.exe -k -mx 640 -my 480 -ox -160. The –k option (« kitchen » mode) allows to format the messages sent by OSC to make them compatible with Animata. 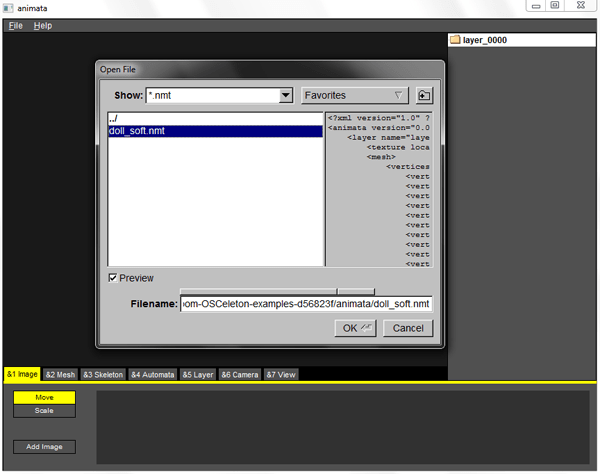 Later runs Animata and open the “doll_soft.nmt” example which is located in the animata folder. Take place in front of your Kinect, and put yourself in position calibration as shown above. When calibration is done, the animata should begin to replicate your movements. If you don’t have Processing, download it here (1.2.1 version). Once downloaded and run it and close it. This will create a lot of configuration files and create a folder named Processing in your Documents. OscP5 is a library which implements the OSC protocol. If you don’t have it, download it using SVN here (If you don’t have a SVN client, download TortoiseSVN). pBox2d is a physics engine for 2-dimensional worlds. You can download it here (currently v0.03). To use these libraries in Processing copy them into the Processing>libraries folder in your documents. Restart Processing if it was open, otherwise run it. 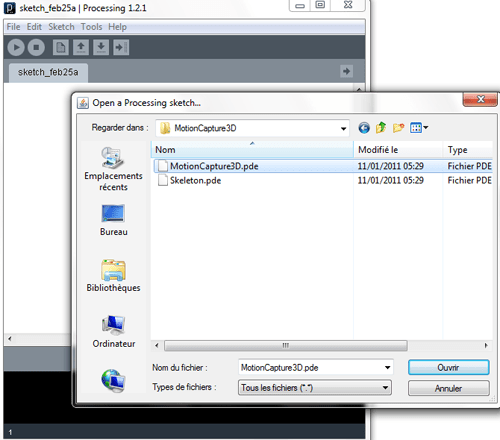 Select Open in the File menu and select the MotionCapture3D.pde sample in the example folder that we have previously downloaded. Run the example by going to the Sketch>Run menu. Put yourself in front of the Kinect and wait until the calibration is done. 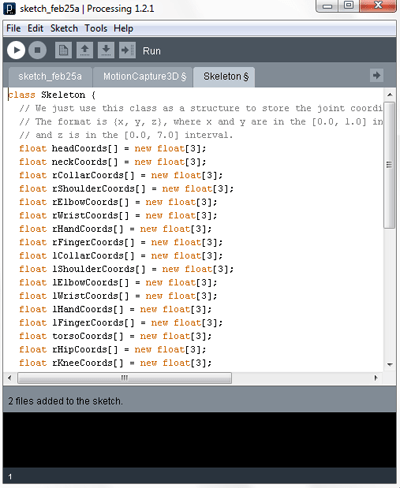 Then you must see your skeleton in the Processing window as shown above. There is also an OpenNIs wrapper for Processing which allows you to access more features such as the depthMap, the handtracking, etc… This library is called Simple-OpenNI-and you can download it here. Install it in the same way as OscP5 and pBox2d by expanding the archive into the Processing>libraries folder in your Documents. Well, now you have all the basis to start the development of prototypes using Kinect while pending the official SDK from Microsoft release. 1> The syntax of the command is incorrect. 1>C:\Program Files\MSBuild\Microsoft.Cpp\v4.0\Microsoft.CppCommon.targets(113,5): error MSB3073: :VCEnd” exited with code 1. I just bought the Kinect and I’m doing some experiment with iPi, but I would like to expand the tracking capability of the Kinect. It is possible to modify the bone position ( of the doll_soft ) in order to shape it like a face, in order to track the face? I suppose that thos position are “sensible areas” so I imagine that the tracking of the face could work in the same way…maybe by tracking markers on the face? Hi this is a nice blog.. 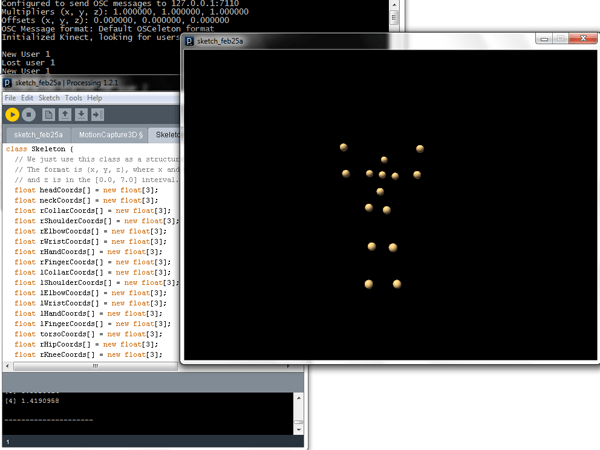 I doing skeletal tracking in WPF C# and i want to do animation like yours. can you tell me how to use animata in this case please ?